NEED YOUR WILDLIFE CONTROL ISSUE QUOTED AND FIXED FAST? WITHIN OUR SERVICE AREA, WE CAN OFTEN ADDRESS THE PROBLEM NEXT DAY! Humane Animal Removal and Pest Control – Get Rid of Nuisance Animals with Us! More than animal removal, we clean and sanitize the problem areas caused by nuisance animals. Also, our preventative pest control services including mice and rodent proofing your home or building means mice will never get in! Animal removal, clean-up and disinfectant application solves the problem – for now. We go further still – our animal removal services commitment means no repeat occurrences on treated areas. Our low price assurance means you get the best price (we’ll match any written quote for equal services!). Serving Burlington, Oakville, Milton and all areas in Halton plus Western GTA and Hamilton including Stoney Creek. 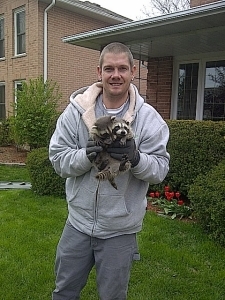 Your local wildlife removal experts are local. NEW! Now DIY homeowners can purchase our metal mesh Animal Proof Vent Roof Covers! Getting rid of animals from your home or business is easy with Regional Wildlife Services. For homeowners and commercial companies alike, get rid of your pest problems fast! Locally owned and managed. Our customers are our local neighbours! Call us today and we’ll get rid of nuisance animals – fast! I understand that getting rid of animals from your home is something you want done fast and effectively. That’s why I give you my personal assurance that our technicians work fast while respecting your home. Of course, we’ll address animal entry points to ensure the problem is resolved. I inspect nearly every work site prior to the job starting. A little trust goes a long way, and your referrals are my best advertising. Call me today. Get rid of nuisance animals now. We're in your area!